Help prevent the spread of an extremely aggressive, non-native aquatic plant called Water Chestnut (trapa natans) that is rapidly taking over nearby Lake Musconetcong. The first step is to educate yourself, your family and friends and everyone that enjoys Lake Hopatcong on how to identify the plant. Second, if you find the plant on the Lake Hopatcong, contact the Lake Hopatcong Commission immediately at 973-601-1070. The majority of the pictures below were photographed in June, 2009 at nearby Lake Musconetcong which is located 1-1/4 miles downstream from Lake Hopatcong. We must all work together to prevent Water Chestnut from spreading to Lake Hopatcong. Besides understanding how to identify and report the plant species, recreational users should take appropriate steps to prevent the spread of nuisance aquatic species between water bodies and learn how to stop aquatic hitchhikers. Print a copy of the water chestnut brochure to keep on your vessel to easily identify the invasive species and follow the simple steps to report Water Chestnut to the Commission. Read about the dedicated effort of the Knee Deep Club Water Chestnut Scout Project to combat Water Chestnut on Lake Hopatcong through their volunteer Water Scouts initiative. Visit the Rutgers Cooperative Extension of Morris County Water Chestnut site for more information including a in-depth presentation, fact sheet and a Water Chestnut reporting form. Want to see how water chestnut can take over a lake. Take a look at this YouTube video of a volunteers removing a form of Water Chestnut from Lake Delmont which is 100 miles southwest of Lake Hopatcong, outside of Allentown, Pennsylvania. Water Chestnut prefers shallow, nutrient-rich lakes like Lake Hopatcong. 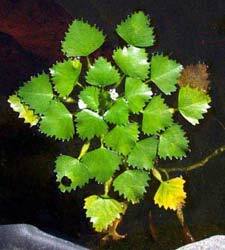 This aquatic plant has a rosette of floating leaves, a half to one inch long, at the tip of a submersed stem, which can reach over 15 feet in length. Although not visible yet, four white petals up to one quarter inch long, bloom from late June to September. ARE THERE ALOT OF SEEDS? An individual seed can give rise to 10 to 15 rosettes, each of which can produce 15 to 20 seeds. One seed can produce 300 new seeds in a single year. Seeds drop to the lake bottom and can remain viable for up to 12 years. One acre of water chestnut can produce enough seeds to cover 100 acres the following year. Learn how to prevent the spread of water chestnut. ANY IMPACT TO RECREATIONAL ACTIVITIES? When the plant occupies a site, most recreational activities such as swimming, fishing from the shoreline, and the use of small boats are eliminated or severely impeded. 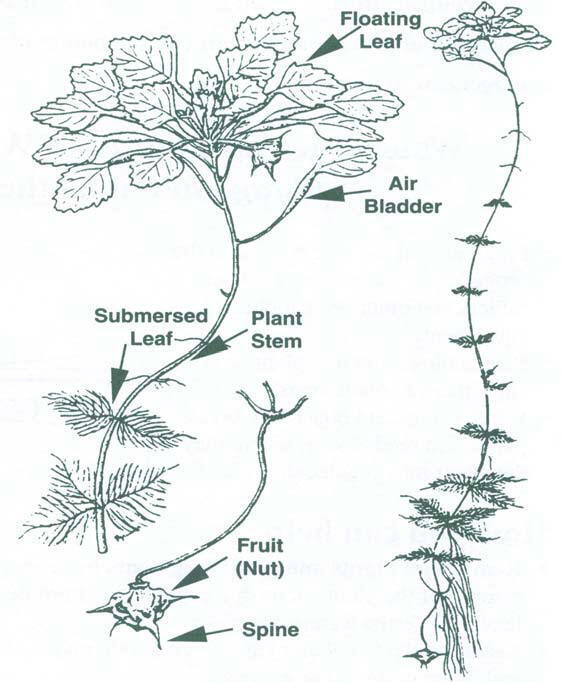 Aquatic Plants of New England Series: Trapa natans L.
Crow and Hellquist 1983. Illustration by Pam Bruns. Simple Procedure are available from The Stop Aquatic Hitchhikers web site which is part of the ANS Task Force public awareness campaign and is sponsored by the U.S. Fish and Wildlife Service and the U.S. Coast Guard. Are you interested in identifying the types of native and non-native aquatic plants found in Lake Hopatcong or learn about other aggressive species that could find their way to Lake Hopatcong? If so, the Identification Manual of Aquatic Plants in Lake Hopatcong and Potential Future Invasive Species is a great learning tool.